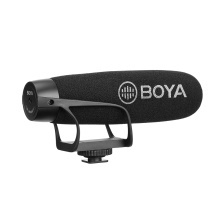 BOYA BY-BM2021 is a super cardioid video shotgun microphone, which offers much better sound performance than using built-in microphone of smartphone, tablets, cameras, camcorders, PC, etc. With both TRRS and TRS audio connector cable included, the microphone is compatible with most smartphones, tabelts, DSLRs, camcorders which has a 3.5mm mic jack. Unique super cardioid polar pattern, its tight pickup area focuses directly in front of the microphone and reduces other surrounding sounds, ensuring that your subject is isolated from any background noise. Reinforced ABS construction, weighs only 63g. The compact and lightweight design of the microphone makes it ideal for handheld shooting. Without any complicated switches or settings, it is mainly powered by cameras, camcorders or smartphone, PC external microphone input, requiring no batteries to operate.